Getting back on-track slowly but surely, I just wish this bloomin' awful weather will do one! It's either really cold or pouring with rain - who wants to get dressed up to the nines in weather like this? I do try, like today I was indoors in the morning, so popped on my gingham cropped trousers - thinking they'd look super cute with my black suede ankle boots, wrong choice as I was freezing when I popped out to run errands and buy ingredients for dinner. It was blowing a hoolie, with the wind whipping around my ankles like nobodies business, I was even asked if my ankles were cold by a shop keeper! That'll teach me - jeans it is next time. Huh!!! Today I'm sharing an awareness post - Bladder weakness. Todays post is sponsored - however these are 100% my own honest comments, unless stated. "Getting enough sleep is key to unlocking good health and well being. There may be many reasons you are not getting enough sleep, however, today bladder weakness doesn't have to be one of them!" "With 61% of women in the UK admitting to experiencing bladder weakness at some point in their lives, TENA Lady understands that frequent toilet trips and the worry of leaks can really disrupt your sleep. 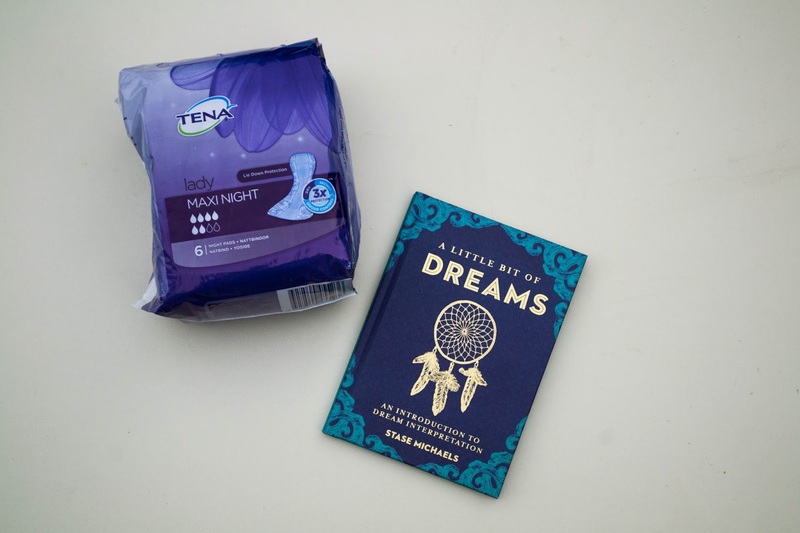 So TENA Lady have specifically designed a night-time range to help you get a better night's sleep. All the above products offer triple protection from leaks, odours and moisture, helping you stay dry, secure and confident wherever your dreams take you!" What else will secure a good nights sleep? What will enhance some intriguing dreams? Well plenty of things come to mind, the first being a heavenly night-time drink. Pukka have just the right mix for the perfect beverage. Their night time sachets are a dreamy collection of organic oat flower, lavender and limeflower which will calm your body, letting you fall into a restful sleep. Thisworks luxu ry dream to sleep collection have an amazing deep sleep night oil that you massage in every night - something of a ritual to aid restful sleep. The smell is divine and feels soft and luxurious on the skin, along with the deep sleep pillow spray and soothing eye mask they will ensure you drift off and have a relaxed sleep! Once you're soundly sleeping - may a Dream Catcher like mine tr ap all your dreams - making them come to fruition when you need them most. 💓 Read on to find out how you can decipher your night visions with the help of an interesting book. Before drifting off there's a couple of books for you to muse over, firstly A Little bit of Dreams will explain your dreams giving some definition to what your sleeping brain is saying. Also a Dream Journal will help you find a peaceful, sleepy dream & it will allow you to jot down significant points and issues that might arise in your slumber. You can make notes when you half wake from a dream or when you get up. Pop it by your bed at night, then you can quickly go back to sleep. Do you know Dreams help give your life meaning. They inspire you to find your passions and live with purpose. They enhance happiness through hope and imagination. A journal is the perfect accessory for you to find out what you want to achieve in life - recording your dreams will help your life ambitions and achieve your potential. I often return to the same dreams, and now it will be nice to jot them down and find out what they really mean. I hope that everyone will have a cosy, snuggly wonderful nights sleep and dream of holidays, new clothes, special outings and many more exciting nice things without the worry of an un-wanted bladder issue, but if you do, fear not because TENA Lady will have you covered! Glad you stopped by today - hope to see you again. I'm off to have a little sleep, who knows what I might dream about - but with my books I'm happy I'll be able to work out what my dreams mean. See you again on Monday, I'm featuring a very special post, so hope you can stop by. A dream catcher! I love it! I used to have one of these as a kid and now I think I need one again! Thanks so much Ashley, I hope you find a dream catcher - I think my daughter might be stealing this one! I don't suffer from bladder weakness but I love the aid in helping fall asleep. That dream catcher is very pretty. Oh I love the sound of that night oil! :) I could do with that, although it's a little early for me to need some of the other products, haha! So many things change when you age though! Hope you are having a wonderful week. The heatwave continues here unfortunately, so uncomfortable! Very different from your weather though! Well done Jacqui for tackling this important if awkward subject. I think you've spoken to the silent majority here as I'm pretty sure most women aren't brave enough to admit that this is or has been a problem for them in the past. The pack is lovely with lots of fab items to encourage a great night's sleep and I for one can honestly say I already use a few of them with success. What a gorgeous dream catcher! I need to check out your meatball recipe, I love to make spaghetti as an easy dinner at least once a week or every other week... I usually get the frozen meatballs, which my kids love... yet, I would like something more fancy! Lol! This is such a great box. I love the little dream catcher! Looks like a great box. I love the idea of a dream catcher :) Thanks for sharing at Welcome To The Weekend Blog Hop, hope your having a lovely weekend. Yes it's got some fabulous items in it, the oil spray is wonderful and smells amazing!